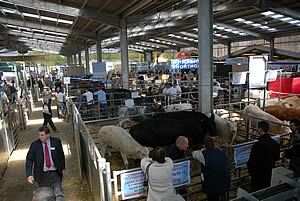 With nine mainline sponsors and a record 150 trade stands and 23 beef breed society demonstrations, the National Beef Association’s Beef Expo 2007 to be held at Skipton Auction Mart on Thursday, May 17, is shaping up to be the biggest and best since the annual event was launched 10 years ago. Thousands of beef producers from all over the UK and Ireland, as well as Poland, Germany, Belgium and other European countries, are expected to attend this year’s event which has adopted the theme “Action for Profit”. “The theme reflects the importance of restoring profitability to the beef industry following the de-coupling of support from production and exposure to the free market,” said leading Limousin breeder, Jim Bloom, Decoy Farm, Scorborough, Driffield, who is chairman of the organising committee. “The Single Farm Payment is subsidising the beef enterprise on most farms at present but it won’t last for ever and is being eroded by modulation which this year has been set at 17% in England – and rising. This means farmers will have to find ways of reducing costs, improving efficiency and maximising returns from the market by precisely meeting buyers’ specifications for weight, grade and quality. Mr Bloom said he was delighted with the support which Beef Expo was receiving from sponsors, trade stand exhibitors and beef breed societies which demonstrated the event’s vital role as a focus for the whole beef industry. “We are greatly indebted to our nine mainline sponsors who are generously supporting the event with hard cash and the record number of trade and breed exhibitors whose presence will ensure the success of the day,” said Mr Bloom. The mainline sponsors are CCM Skipton, who are hosting the event at Skipton Auction Mart, Dugdale Nutrition, Dunbia, EBLEX, Intervet, Keenan, KW Alternative Feeds, British Limousin Cattle Society and Yara, who are also sponsoring the open stockjudging competition. The following beef breed societies have reserved space for live cattle demonstrations – Aberdeen-Angus, Bazadaise, Beef Shorthorn, Belgian Blue, Blonde, Charolais, Galloway, Gasgon, Gelbvieh, Hereford, Highland, Limousin, Lincoln Red, Longhorn, Luing, Murray Grey, Parthenaise, Red Poll, Salers, Simmental, South Devon, Stabiliser, Whitebred Shorthorn. On the day before Beef Expo, a tour of three beef farms in the Skipton area has been arranged (limited to 300 delegates) followed by a pre-event conference at Skipton Auction Mart sponsored by Dovecote Park Ltd and pre-event dinner in the Rendezvous Hotel, Skipton. The dinner, limited to a maximum of 400, is already sold out.